If digital communication is part of your team's mandate, this workshop could help your team work better, faster and more effectively. For more information, contact Mr Elliot Wong at elliotwong@nus.edu.sg. In today's digital world, social media plays a big part in the way we communicate in business. For marketing, for internal communications, for media outreach and more.The challenge for organizations is how to achieve tangible, strategic success with limited resources. 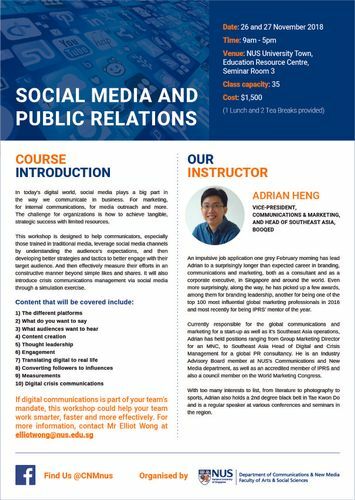 This workshop is designed to help communicators, especially those trained in traditional media, leverage social media channels by understanding the audience's expectations, and then developing better strategies and tactics to better engage with their target audience. And then effectively measure their efforts in an constructive manner beyond simple likes and shares. It will also introduce crisis communications management via social media through a simulation exercise.